How can we emulate Delhi voters when we don't have a party like AAP or a leader like Arvind Kejriwal? Copy cat leaders are aplenty here but they are not worth a dime! మన రాష్ట ప్రజలు ఇంక కుల, మత మరియు దనం పిచ్చి నుండి బయట పడలేదు, కుల పిచ్చి నుండి భయటకు వస్తే తప్ప డిల్లి లాంటి పలితాలు సాధ్యం కాదు. It is very pity about our mental status and attitude that till today we, so called educated including youth are not coming out of the ageold political tactics gambling around the cast feelings. We are till now unable to think of pure politics for betterment and welfare of people and country. The above comment of Anonimous is example that he could not come out of the cast pit. 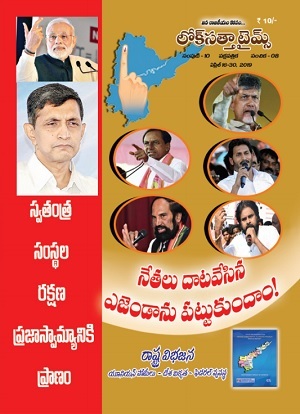 Think JP's caste has less to do outside Andhra Pradesh electorally, where JP has the big role as national president. 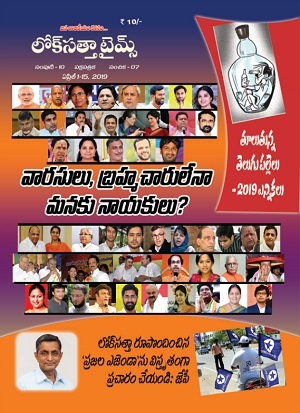 Within AP, the president of the Party state wing Mr.Katari Srinivasarao doesn't belong to JP's caste. Katari, who is from BC, has to deal with people of JP's caste. So instead of deceiving ourselves and decieve others by throwing mud with hasty anxiety on Lok Satta to coverup our casteism, let us learn to think and act above caste. "Big role" in a miniscule party!